By drawing on my sales and management experience, along with my mastery of teaching and training, my goal is to help salespeople, managers, and entrepreneurs increase their income and experience a long-term cycle of growth and achievement. Whether you are the CEO of a major firm, an owner or manager of a small business, a sole proprietor, or someone dealing with personal family decisions, the FOCCUSSED approach described in this book will make you a better decision maker. Small business owners make decisions on contracts, vendors, and general operations. Financial services professionals such as realtors, insurance agents, and financial planners, help clients make decisions. Franchisees make personnel, equipment, and financial decisions. Parents make decisions about schools, family finances, home and car purchases, etc. Investors make decisions about buying, selling, and managing cash flow and tax implications. Let's face it, decision making is at the heart of virtually everything we do. In all cases, we have to deal with values, alternatives, and uncertainty. Are you ready to become a more FOCCUSED decision maker? 101 Ways To Get Motivated! Get Motivated: Once earning less than $2,000 a year, Omar made changes in his life in order to achieve multi-millionaire status ten years later. His inspiring stories and motivational precepts will help you get out of the slump that holds you back! Omar encourages you to face your fears, kick your counter-productive habits and become a calculated risk taker. Taking no for an answer is never an option! Learn what it takes to never be denied and become a peak performer in your industry. Omar will teach you to THINK about where you are now, where you WANT to be, and HOW to get there as quickly as possible. You will learn: Analyze what your subconscious mind has been trying to tell you Going from vision to acquisition Premeditated living: Seeing, Feeling, Wanting, Getting The power of choice and a positive mental attitude Preprogramming Power of Choice = Premeditated Success. In life it's not what happens to you it's what you do about what happens to you. This book will help you to overcome obstacles that are holding you back from achieving your greatest potential. If you want to learn how to live a peak performance life, learn lessons from this book to attain an epic life. Since you cannot borrow from one day to the next, and you definitely cannot master time by slowing its passing or stopping it altogether, you've got to learn to effectively manage the time that's given to you every day. It's the same 24 hours that has been allotted to the rest of us. Have you ever thought of it that way? Bill Gates has the same 24-hour day that you do. Hillary Clinton works within the same 24-hour day as you. Even prisoners cannot be deprived of those 24 hours a day. So, how will you choose to spend your next 24 hours-productively or pathetically? It's your choice. If you said "yes" to productively, this book will give you the tools to Manage Your Time Instead of Letting It Manage You! Health is wealth-the energy to succeed. By taking control of your life choices and learning how to master your habits you can embark on your life's journey to personal fulfillment. Omar knows what it's like to not have the body or the energy you've always dreamed of. At an early age he personally lived the agony of being and feeling unhealthy and inadequate. Health and fitness turned his life around and gave him the discipline, the body and the energy to succeed. Learn how to increase your capacity for stress by learning how to recapture unlimited energy. This book will be your tool to reaching new heights mentally, physically and emotionally. Your daily decisions can either keep you from achieving the body you desire or create for you the body you've always dreamed of. This book will show you how to make the right decisions and achieve the energy to succeed! Learn how to network your way to the top. In this book, you will learn how to overcome fears, experience success, and achieve your dreams. This book will provide you with a step-by-step process to help you to recruit, train, and retain a superior organization. My mission is to inspire peak performance and leadership in others, enabling them to reach their greatest potential in life. Each business day, companies around the world hold more than 11 million meetings, some of them very productive, some not productive at all. I believe that meetings are a vital management tool and a key component of organizational success. 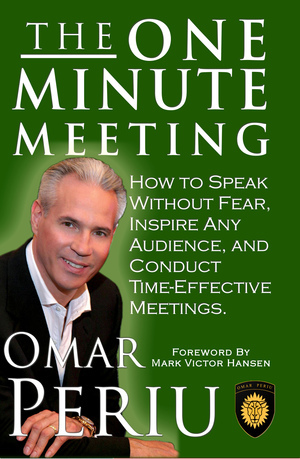 With this book you will be empowered to gain control of one of the world's biggest time robbers—ineffective meetings. The principles and strategies that are covered in this book were developed for you to speak without fear, inspire any audience and conduct time -effective meetings. My mission is to inspire peak performance and success in others, enabling them to reach their greatest potential in life. Get Fired Up has been a lifelong goal of investing everything I have learned into this two-part book, which talks about the mind success connection and the steps that need to be taken to achieve greatness.